This page describes how JMRI uses System Names to access MERG CBUS-attached resources. His club has adopted the convention of 1 to 9999 for turnouts and 10000 upwards for sensors. but they tie any relevant sensors to the turnout numbers e.g. TO_1 is +1 and the feedback from this is +10001 for one way and +11001 for the other way. Using short events (or device numbers) this way makes life very simple with JMRI. They control the turnouts from the CANCABs as well (also Smartphone throttles), this is reflected in the JMRI panel and works a treat! Their layout control panel is on a touchscreen monitor connected to a RPi 3B running JMRI, with additional control panels through JMRI Web Server. Another use of event segmentation could be for modular club layouts, where various club members building a section at home, then bringing it together into 1 big super layout. Module 1 would have events 1,000 > 1,999 Module 2 would have 2,000 > 2,999 etc. Pete uses pretty much exclusively long events. For events sent from JMRI, he segments by node number that JMRI generates (for example, node 99 for turnouts, node 98 for signals and node 97 for control sensors). This makes it very easy to see what the events are for when looking at an event log. For all input sensors from CBUS, he leaves the long event as generated by the CBUS module, so it will retain the node number of that module, (eg; Node 256 event 1) so there's no risk of generating the same event as a cab. Because he doesn't use short events, there's no need to segment by the event/device number. It also avoids the whole task of having to teach any producer events, just using what comes from the modules by default. When JMRI is started, it doesn't presume that all sensors, turnouts and lights are active or inactive, they have an unknown status. The vast majority of MERG module kits can send the current status of their inputs or outputs in response to a SOD event taught to that module. When JMRI loads a panel, and the Track Power is on, block values from the previous session are loaded if the block is active. It may make sense to set Track Power to Off on JMRI Startup and when a panel loads, switching the track power on after the panel has fully loaded. JMRI DOES NOT attempt to create Sensor objects from the traffic that it hears on the MERG CBUS network, unlike some other hardware systems. This is because MERG CBUS is essentially a networking protocol, not a sensor generator. Events are not intrinsically associated with specific hardware objects, people can use events in many ways. You can request the status of a sensor by clicking Query in the sensor table. MERG CBUS is setup in JMRI for 4 types of turnout ( output ) feedback. Turnouts have 2 states, the commanded state, and the Feedback state which is used on panel displays and elsewhere. Direct - When the commanded state is changed, the feedback state will reflect the commanded state. Delayed - When the commanded state is changed, the feedback state will reflect the commanded state following a brief delay. 1 Sensor - When the commanded state is changed, the feedback state will not change. 2 Sensor - When the commanded state is changed, the feedback state will not change. You can request the status of a turnout by clicking Query in the turnout table. If a turnout uses 1 or 2 sensor feedback, these sensor statuses will also be requested. See JMRI : Turnout Feedback for more info. JMRI Reporters do not have Off or On events, they just use a device ( short event ) or node number. A typical system name for a reporter would be MR123 or MR1234 ( no event On or Off ) . The DDES and ACDAT OPC's are used for reporter data. When a DDES or ACDAT OPC is heard on the network, JMRI will look for a reporter matching the device or node number in the Reporter Table. If a reporter exists, the ID tag within the 5 data bytes will be looked up from the ID Tag table. If there's no matching ID Tag on the table, one will be created and updated. If the ID tag was previously active for another reporter, the previous reporter will have the tag removed from its report. If the DDES or ACDAT message is coming FROM JMRI, the previous reporter will not be updated, the existing reporeter is only cleared by messages coming in to JMRI. Reporters are created automatically and will populate the Reporter table when a DDES or ACDAT OPC is heard on the network. Valid reporter numbers are minimum 1, maximum 65535. The DDES ( device number ) and ACDAT ( node number ) messages are currently handled in exactly the same way, ie the first 2 bytes are used as the Reporter identifier. This means that a reporter created via a DDES of device 77 will respond to a ACDAT of node 77, and vice versa. Reporters are saved in your main panel file, along with turnouts and sensors etc. ID Tags cross-session automatically, no saving is necessary. When adding an item to your JMRI Sensor Table, Turnout Table, Light Table or Reporter Table, a JMRI system name is automatically created from the hardware address you input. This really is all you need to know to get started, the rest of the information on this page is aimed at advanced use cases, debugging panel xml files, and system development. JMRI internally associates MERG CBUS events with individual JMRI objects (Sensors, Turnouts, Lights, etc.) via the JMRI System Names. Depending on which MERG CBUS event IDs are used on a particular layout, these system names can get very long, in which case the "user names" are much more useful. The 1st letter of a sensor, turnout or light system name is the JMRI system letter, generally "M" for MERG connections. JMRI sensors use the type letter "S", e.g. MS+123;-345" defines a Sensor that follows the "123 ON" and "345 OFF" events to change state. 65,536 nodes and 65,535 events gives approx 4,294,901,760 event combinations. 65,535 is unrealistic for events within a node but does allow for useful segmentation of event ranges. MERG module kits can use the whole CBUS range of event numbers, on a reset startup operating in SLiM short event mode. A Sensor is defined by two events: The one that sets it ACTIVE, and the one that sets it INACTIVE. MS18 The number is decimal. it may be useful to connect the ACTIVE or INACTIVE transition of a JMRI Sensor to an OFF or ON MERG CBUS frame respectively. and goes INACTIVE when an ON frame with ID number 21 is received. MERG CBUS event numbers (usually) contain a node number in their most-significant bytes. You can mask off part of the MERG CBUS packet, so any values in the masked part will still match, using the "M" format letter. "M" indicates the start of a hexadecimal mask that will be applied, where 1 bits in the mask will be zero bits in the resulting value. In the example above, "18" through "1F" will match. This is particularly useful for matching e.g. 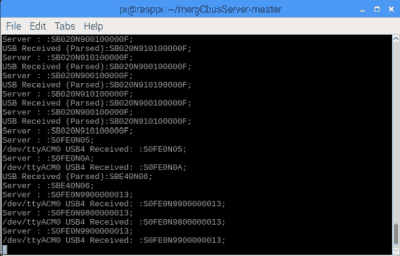 MERG CBUS short events, where parts of the packet include the node number which should (usually) be ignored. Hexadcimal numbering is based on the power of 16, using 0-9, then A-F.
MERG CBUS modules communicate by messages with a fixed format: One byte of command and length information, followed optionally by additional data bytes. In it's most simple form, this is used to send identifiable "events". In turn, events come in two types: "ON" and "OFF", with two forms, short ( SLiM ), and long ( FiLM ). These are actually sent across a MERG CBUS network in the form of an Opscode, the command information. There are 255 ops codes, the length of the data string following the Opscode changes depending on which Opscode is used. There are multiple Opscodes for events, Controlling and programming DCC devices, DCC consisting, Programming nodes with Node Variables, Programming nodes with events, Fast clock and temperature information, RfID reader data, and many more. It's possible to connect a Sensor to arbitrary CAN frames by specifying their data content as a hex string, indicated by "X". This allows a Sensor or Turnout to disregard any intrinsic meaning to "ON" and "OFF" events, and allows it to respond to, or emit any frame on the layout. Ensure you use the right opscode, eg if you include Nodes for a FiLM address, use ACON instead of ASON. Sensors, Turnouts and Lights stored as Hex response events using the long and short response OPCs will not be recognised as these are translated to standard on and off events just before the ( sensor turnout or light ) internal message match check. Apart from these specific OPCs, Sensors Turnouts or Lights can store any hex combination, they need both an on and off side seperated by a ";". The CAN frames can send MERG CBUS opscodes in the hex form of the code you require. A MERG CANCMD confirms request with an ESTOP 06 Opscode. All of these Opscode messages are sent with the Standard CAN event frame, however the protocol also allows for access to extended CAN frames. The extended frames do not interfere with the standard frames, hence modules can be targetted for boatloading by module number, without affecting Standard CAN event frames. Although module firmware updates are not currently available within JMRI, full support for this is available via 3rd party software ( FCU - FLiM Configuration Utility ), available free for MERG members to download. For advanced system development and packet proving, you may prefer to view the full packet across various applications, eg MERG CBUS SERVER. The JMRI MERG CBUS Console Tool can be very useful in seeing what is being sent across the network by the hardware addresses you create. The console is intended to be a tool to help users monitor packets using short and long events, and may attempt to beautify the output. Check the MERG CBUS wiki and developers guide for more info and absolute specification. The majority of Opscodes according to the MERG CBUS developers guide 6b are supported in some sort of form. All outgoing JMRI MERG CBUS messages have their OPC priority added to the header section of the message. CbusBundle.properties for English text translations of OPCs. There's a list of supported OPCs for each JMRI MERG CBUS tool support page. The flexibility in the hex form of creating Sensors, Turnouts and Lights allows any OPC to be sent, or received as an input. This does not currently include the extended data event OPC's. Messages sent from, and received by JMRI are handled the same by MERG CBUS Reporters.